Politics, paranoia, and preening stars: a sometimes funny, sometimes rueful memoir of filmmakers in exile during the McCarthy inquisition. Barzman, a columnist for the late Los Angeles Herald Examiner and screenwriter, opens her account on a sweet note of revenge: her successful organization of a protest at the 1999 Oscar ceremonies against lifetime-achievement honoree Elia Kazan, who had infamously named names before the House Un-American Activities Committee half a century earlier. Only a third of the audience applauded Kazan, she reports (by way of eyewitness and pal Sophia Loren); Charlton Heston and his clique clapped, though the television cameras made it seem as if the protestors were fewer in number. Barzman had reason to be annoyed at Kazan; it was through his testimony and that of a few other turncoats that her husband, the celebrated screenwriter and playwright (and onetime Communist) Ben Barzman, earned a spot on the blacklist and had to remove himself and his family to Europe in order to find work. Not that exile was all bad: Barzman’s crowd included the likes of Loren and Pablo Picasso (and even Heston, whose vehicle El Cid Barzman scripted, without credit). Still, it had its cost: Ben Barzman grew increasingly depressed at being away from the Hollywood scene, and Norma took out her frustrations in a marriage-damaging affair or two. Honest and self-critical, Barzman has a nicely sharp tongue, and she gets in wounding digs at a number of targets, not least of them John Wayne (“a feudal lord surrounded by a permanent retinue of a dozen technicians, makeup, wardrobe, and lighting pals who went wherever he went”) and Richard Nixon—whom, she suggests, wasn’t above taking a payoff to keep a suspected pinko off the Hollywood dishonor roll. 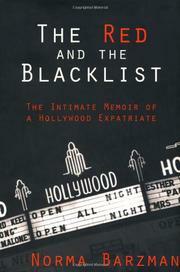 Dishy, and substantial, contribution to film history, and to studies of the unfortunate McCarthy era.